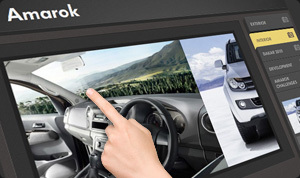 Volkswagen Amarok Touch Screen from Bottomline Interactive on Vimeo. With the arrival of the VW Amarok in South Africa, Barons tasked us with creating a launch campaign on a dealership level aimed at increasing awareness of the Amarok's extraordinary capabilities as well as to help increase their vehicle sales leads and customer database. We decided to approach GrandWest in a bid to partner up with Barons as their location and surrounding areas were ideally made up of a high density of Amarok’s key target audience. The resulting concept was to merge an explorative experience of the new Amarok with test drive request forms and a competition entry mechanism that benefitted both the dealerships and casino alike. The difficulty of placing a kiosk in a casino is competing with the explosion of colours and sounds already emanating from the gaming floor. To overcome this, two branded touch screen kiosks were placed on either side of an Amarok on the casino walkway to and from restaurant and entertainment areas ensuring the display was seen and interacted with. 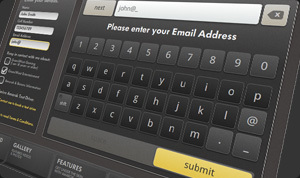 The software was designed to be simple and intuitive, making use of high contrasting colours and allowed for instant access to information such as full 360 vehicle exploration, picture galleries and feature videos. Each kiosk was also equipped with a thermal printer to distribute branded confirmation slips of competition entry details and draw date information. The promotion proved to be a huge success for all parties involved. 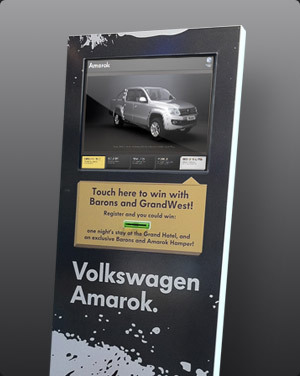 The touch screens generated enough test drive requests for each dealership to sell all of their available Amarok stock and even proved to be a successful new and unique way for GrandWest to engage their customers in any future promotions. Truto even gained some additional insights from the integrated tracking tools which allowed for a solid analysis of the touchscreen’s successes and shortfalls and gave a new understanding of how visitors engaged with the touch screen at different times throughout the day which have been applied to all future campaigns.